Robotic automation is revolutionizing warehouses. Capable of picking, packing, and shipping items, robots enable lower costs and enhanced productivity. Innovative automated systems offer an integrated approach to inventory, quality control, and order fulfillment, streamlining processes and boosting competitiveness. The present article will present the most recent trends in robotic warehouse automation and discuss the R&D tax credit opportunity available for innovative companies using robots to reduce the complexity and the costs associated with material handling. Robotic automation stands out as a unique opportunity to enhance America’s competitiveness. It reduces the need for outsourcing in favor of low cost labor, keeping plants and jobs in the U.S. Throughout the nation, a growing number of companies are turning to robotic warehouse automation as a means to reduce costs and complexities associated with handling materials. Warehouse robots are taking over dull, repetitive tasks, and freeing up people to perform more value added work. They streamline the complex logistics of material handling, dramatically increasing overall output. Flexible, scalable, and easy to implement, sophisticated software, hardware, and robotic engineering are increasingly adaptable to the frequent changes in product design and operational strategies. One of the most iconic examples of robotic warehouse automation is Amazon. In 2012, the Seattle online retailer acquired robotic systems manufacturer Kiva Systems for $775 million. Since the acquisition, Kiva stopped selling robots to previous customers and has focused exclusively in improving software and hardware to meet Amazon’s needs. Warehouse automation is seen as an integral tool in the retailer’s strategy to compete with the immediacy of in-store shopping. Saving time in warehouse product handling means being able to offer quicker delivery. This is particularly crucial during the holiday season, when Amazon generates more than 30 percent of its annual revenue. In addition to saving time, robots are expected to reduce Amazon’s fulfillment costs, saving between $400 and $900 million annually, or 20 to 40 percent of the current $3.50 to $3.75 per order. Productivity is also expected to rise considerably – an average picker walks twenty miles every day and “picks” 100 items per hour; this number triples to 300 when robots are deployed. Kiva’s innovative technology consists of movable shelves and mobile robots, which work in real-time and are controlled by a server. When an order comes in, the robot is instructed to find the specific shelf where the product is located and bring it to the designated picker. Kiva shelf-toting robots have already been deployed in Amazon’s warehouses in California, Kentucky, and Texas, among other states. In May, the retailer had 1,000 robots working on its facilities. The company announced plans to expand this number to 10,000 by the end of the year. Amazon’s example sheds light on the future of warehouses. Robotic automation can revolutionize the economics of labor and capital-intensive activities, making warehouses safer, more productive, and more cost-effective. 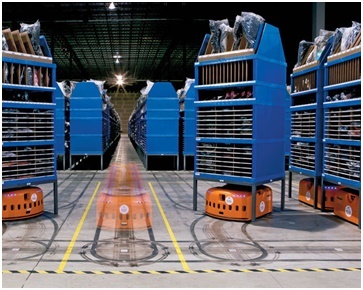 Warehouse automation often takes the form of mobile autonomous robots capable of sorting, storing, and delivering materials. Potential applications include picking, palletizing, packing, loading trucks, etc. I. Picking: A prominent member of the Massachusetts robotics cluster , Wilmington-based Symbotic has been a pioneer of integrated supply network automation solutions for warehouses and distribution centers. The company’s MatrixSelect is a new breed of Automated Storage and Retrieval System (AS/RS), designed to optimize fulfillment, transportation, and logistics. Symbotic's no-touch handling system is smarter, faster, and more user-friendly than conventional AS/RS. It consists of a robotic-enabled structure capable of increasing storage capacity by up to 30 percent. Such gain in product density is possible through the elimination of forklift aisles and the complete vertical and horizontal use of warehouse space. The innovative system employs mobile autonomous robots called MatrixBots, which can travel freely throughout the storage structure accessing any product, in any location at a very high throughput rate. Capable of picking and restocking, MatrixBots can handle high volumes of products of variable sizes. II. Palletizing: For many new companies implementing warehouse robotics, palletizing is a natural starting point. When performed manually, this task can be ergonomically challenging and can easily lead to injuries. Acknowledging the growing demand for automated palletizing, Yaskawa Motoman, an American subsidiary of the Japanese company Yaskawa Electric Corporation, developed a range of robots specifically designed for layer-forming, palletizing, and depalletizing applications. With 4-6 axis of articulation, Yaskawa’s palletizing robots have payload capacities between 50 kg and 800 kg. They are equipped with MotoSight, a 2D and 3D vision guidance technology that enables work in both structured and unstructured environments. They also feature easy-to-use, feature-rich palletizing software and controllers that allow for homogeneous case or bag palletization. Yaskawa’s innovative hardware and software combination is based on the notion that effective palletizing robots should not be restricted to picking products up and putting them down. They must be able to factor in the necessity of stability, which is key in preventing damages, and store-ready sequence, which speeds up delivery and reduces transportation costs. III. Loading and Unloading: Other demanding and injury-prone activities in warehouses is truck loading and unloading. Common shortcomings include inconsistent and slowed loading operations, damaged products, and thefts. Aiming to tackle these issues, Yaskawa Motoman developed robotic solutions for truck unloading and mixed-case depalletizing. 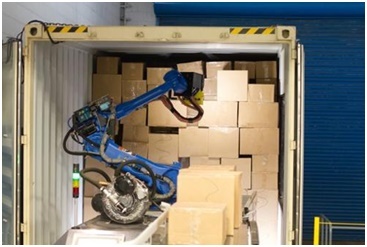 Using intelligent vision technology, Yaskawa’s innovative robots are capable of finding the location of randomly positioned boxes, which are then quickly unloaded or de-palletized. Located in Elk Grove, Illinois, Wynright is also a provider of intelligent material handling systems. The company won the 2013 NextGen Game Changer Award for its Robotic Truck Unloader (RTU). Wynright’s robots are capable of dealing with a number of variables encountered when loading and unloading. Through the use of innovative 3D vision technology, they can recognize size, shape, and location of cases. Complex algorithms allow them to make intelligent decisions about the best way to take products off the stack and place them on conveyors. IV. Packing: Packing is yet another warehouse task that can be automated. Headquartered in Greenville, Wisconsin, QComp Technologies, Inc. has developed a modular, portable, and pre-engineered robotic packaging system. QComp’s space-saving Robotic Solo Case Packer Cell packs individual products into shipping cases or containers at a rate of up to 30 layer picks per minute. Using two advanced robots, the company’s Duet Case Packer Cell can pack up to 150 products per minute. From Brewerton, New York, Schneider Packaging Equipment also specializes in robotic case packing. 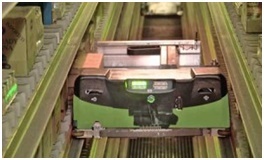 The innovative Schneider Packer-Palletizer solution is a unique, cost-effective automation solution for both packing and palletizing. One single robotic cell erects cases, loads them with products, seals, labels, and finally palletizes them. 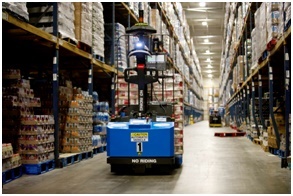 Automated guided vehicles (AGVs) are promising enablers of robotic warehouse automation. Located in Pittsburgh, Pennsylvania, Seegrid has developed state-of-the-art robotic pallet trucks and tow tractors. The company’s innovative vision-guided solutions illustrate how AGVs can revolutionize the movement of materials in warehouses, increasing productivity and safety, reducing labor and operating costs, and preventing equipment and product damage. Seegrid’s flexible AGVs do not require additional infrastructure, such as laser, wires, tapes, or magnets for navigation. The vehicles use evidence grid technology, an application of probabilistic volumetric sensing, developed at Carnegie Mellon University. This innovative technology combines multiple views of an environment, generating various probabilities of occupancy for each point in space. It compensates for eventual uncertainties in the performance of sensors and possible changes of setting. Seegrid’s vision-guided AGVs use a 360-degree array of stereo cameras that capture images and record thousands of features along different routes. These recorded features are use to build a 3D map, which allows the robotic vehicles to follow trained routes without the need for human assistance or the addition of special features, landmarks, or positioning systems. Due to the great flexibility of the vision-guided technology, Seegrid’s robotic vehicles are operational from day one and provide immediate returns on investment. The innovative solution is an example of how robotic systems can contribute to enhanced profitability and competitiveness. In traditional forklifts, the operator accounts for up to 70 percent of the operating costs over the life of the vehicle. While a fully burdened forklift operator costs between $20-35 per hour, Seegrid’s robots can transport products throughout a warehouse for as little as $2.24 per hour. Also, forklift operators classify as one of the highest insurance premium categories. Robotic forklifts can substantially reduce workers’ compensation costs by taking over this risk-prone activity. Software works as a robot’s brain. Advances in robotics software are making warehouse automation systems more flexible, scalable, and easier to implement. The development of more sophisticated software responds to the evolving needs of end-users and reflects the growing demand for systematic approaches that enable communication between different warehouse activities. When it comes to improving robots’ performances, recent trends include artificial intelligence, enhanced perception technologies, such as 3D vision, teachability, and improved speed and accuracy. Based in Nashiville, Tennessee, Universal Robotics, a leader in 3D flexible automation, has recently introduced Neocortex, next generation artificial intelligence software that allows for unlimited box handling and depalletizing. Universal’s Neocortex uses sensor information to learn and discover multi-dimension patterns in chaotic environments. It is based on an intuitive learning technology originally developed by NASA and Vanderbilt University, which, when applied to the material handling process, enables fast and flexible identification of any box, independent of size or condition, weight, orientation within the work cell, label quantity/type, or box graphics or color. The innovative technology can be integrated with Universal’s Spatial Vision® Robotics 3.2, 3D vision guidance software that uses off-the-shelf cameras, sensors, and lasers. Combined, these solutions represent a significant breakthrough in robotic perception technology. Potential benefits, which include greater speed, increased safety, and less than 24-month payback, illustrate how software advances can revolutionize robotic warehouse automation. In addition to enhancing robots’ capabilities, software can provide a more comprehensive approach to warehouse automation. Integrated supply network automation solutions can consolidate and simplify material flow, contributing to increased throughput. One example is the communication between warehouse management software and palletizing robots as a means to optimize order selection and tooling adjustments. In food distribution, for instance, robotic palletizers must deal with a considerable diversity of packages, which require different tools – case handlers, tray handlers, vacuum heads, etc. Software integration can prevent the frequent back and forth of tools, by creating sequences of similar products. In this scenario, the communication between management software and the robotic solution contributes to shorter cycle times, greater accuracy, and enhanced productivity. Simply put, advanced software can choreograph product flow. It takes into account all the characteristics of products –type, dimension, destination, etc. - and builds an optimal, virtual pallet that is then reproduced by robots. This allows, for instance, for light, fragile cases to be placed on top of heavy ones and for products to be organized in store-ready sequences. In an even broader approach, innovative software can help robots multitask. Symbotic’s robotic picking solution, for instance, is programmed to perform “inventory grooming” when not fulfilling orders. Advanced software enables the automated system to constantly reposition stored items in order to improve retrieval speed and optimize throughput. A growing number of innovative warehouse management software offer an integrated approach to inventory, quality control, and order fulfillment. Instead of being isolated, stand-alone units, robots become part of a strategically designed, highly productive system. Finally, advanced software for robotic warehouse automation can also serve as important sources of data. The unprecedented access to information, including cycle times for each task, can greatly contribute to quality and productivity improvements. Despite major advances in warehouse automation, there is growing consensus around the idea that robots should not replace humans but to work alongside them. Instead of substituting workers, automation is making them more efficient. In this context, a new generation of collaborative robots emerges. Designed to operate safely in human-occupied spaces without the need for safety constraints, the so-called cobots are flexible and capable of performing multiple tasks. 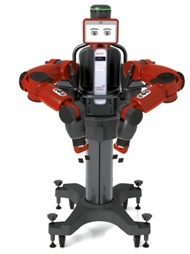 Manufactured by Rethink Robotics, Baxter is an iconic example of the huge potential of cobots. Weighing 165 lbs., Baxter has two 7-axis arms connected to a torso, each of them capable of lifting up to 5 lbs. It features an LCD display for an animated “face” that reacts to human interaction. Additionally, Baxter has a built-in 360 sonar and front camera sensors to detect human presence, integrated vision for movement and object detection, and interchangeable end-effectors for easily switching tasks. Baxter requires no complex programming or costly integration. It presents behavior-based “common sense”, or intuitiveness. In other words, it is capable of sensing and adapting to a task or environment. Baxter’s $25,000 base price has made it an affordable solution for a growing number of businesses. 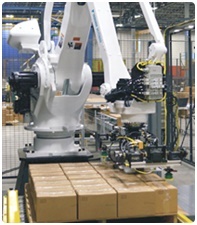 In warehouse environments, collaborative robots, such as Baxter, can be used in a variety of tasks, which include picking, packing, loading and unloading, among others. The perspective of accelerated returns on investment largely explains the increasingly widespread adoption of warehouse robotic solutions. New businesses introducing robotic warehouse automation experience a typical economic payback of less than a year for many of the new robot categories. Additionally, such businesses can take advantage of federal R&D tax credits, which further lighten the economic burden of the robotic investment. 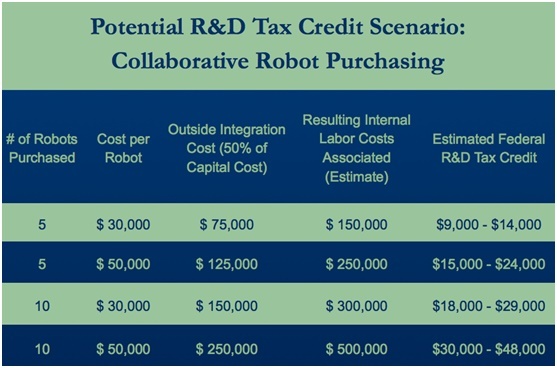 The following table illustrates potential R&D tax credits scenario for the acquisition of collaborative robots. Operating warehouses is a capital and labor-intensive business. Robotic automated solutions emerge as a means to streamline processes and increase profitability, revolutionizing the economics of the supply network. Robotics companies developing new and improved warehouse solutions as well as manufacturers, retailers, and distributors implementing robotic warehouse automation should take advantage of federal R&D tax credits.